There will still be time until the 12th of April to visit the double exhibition hosted in the recently restored Liberty Villa Argentina (in the sea town of Viareggio, Italy), with the works of the painter Lorenzo Viani and the photos of Guido Zeppini. Two artists mean a double opportunity to get closer to the Great War through different "media" in the same location. On one side you have Lorenzo Viani, considered an important representative of the Italian expressionism and on the other you can meet the interesting photographies of the Captain and doctor Guido Zeppini. This is just a reminder of the extension of this successful exhibition that was supposed to end last Sunday, the 1st of March, and a link to a meaningful gallery with some pictures of the works here temporary lodged. 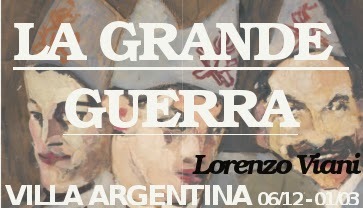 "La Grande Guerra di Lorenzo Viani. Viareggio-Parigi-Il Carso. Pittura e fotografia della Grande Guerra in Lorenzo Viani e Guido Zeppini"